1. 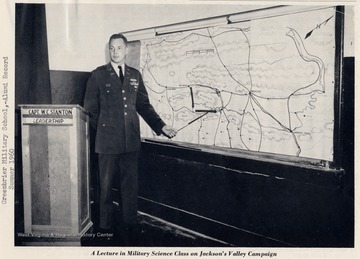 Stanton, Captain W. C. , Presenting a Lecture in Military Science Class on Jackson's Valley Campaign. 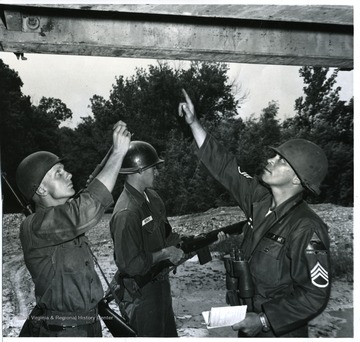 Stanton, Captain W. C. , Presenting a Lecture in Military Science Class on Jackson's Valley Campaign. 2. Wesley Methodist Church Decorated for Easter, Morgantown, W. Va.
Wesley Methodist Church Decorated for Easter, Morgantown, W. Va. 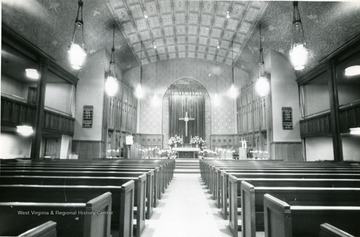 Interior of Wesley Methodist Church located on the corner of High Street and Willey Street. 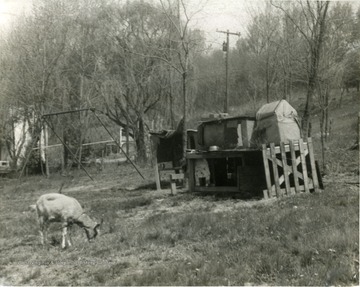 'Easter of 1960'. 3. 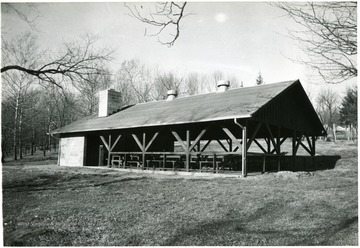 Picnic Shelter at Suncrest Park in Morgantown, W. Va.
Picnic Shelter at Suncrest Park in Morgantown, W. Va.
4. Bookfair Group, Morgantown, W. Va.
Bookfair Group, Morgantown, W. Va.
5. 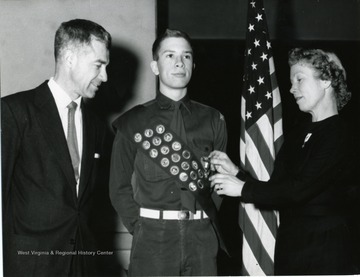 Garlow Family at a Eagle Scout Ceremony, Morgantown, W. Va.
Garlow Family at a Eagle Scout Ceremony, Morgantown, W. Va.
Mrs. Garlow pins an Eagle Scout award onto son David's sash while his father John looks on. 7. 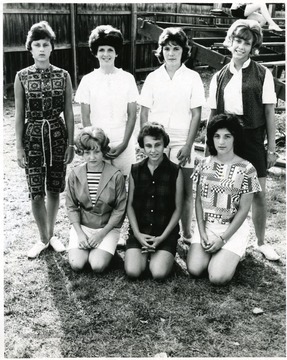 Unidentified Young Women's Group, Morgantown, W. Va. 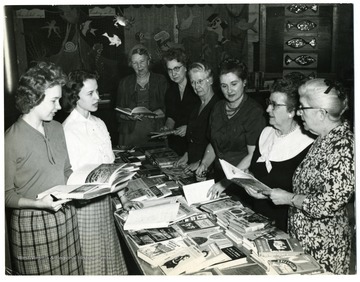 Unidentified Young Women's Group, Morgantown, W. Va.
Top row, left to right: Jane McClung, Mary Frances Duffer, Jane Taylor and Mary Beth Quigley. 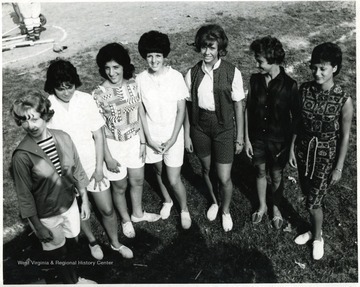 Bottom row, left to right: Judy Haley, Teresa DeAngelis and Mary Ann Sellaro. 8. 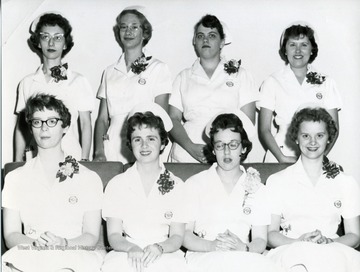 Monongalia General Hospital Nursing Class, Morgantown, W. Va.
Monongalia General Hospital Nursing Class, Morgantown, W. Va.
10. 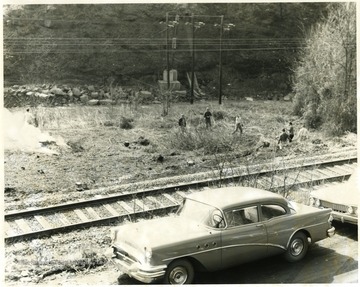 Work Crew in Decker's Creek Ravine, Morgantown, W.Va.
Work Crew in Decker's Creek Ravine, Morgantown, W.Va.
11. 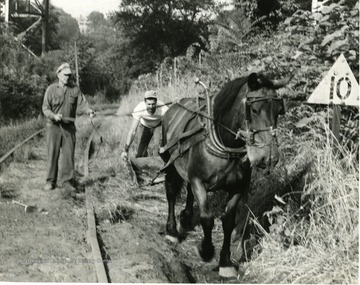 Clearing Ditches along the Baltimore and Ohio Railroad Tracks in Morgantown, W. Va.
Clearing Ditches along the Baltimore and Ohio Railroad Tracks in Morgantown, W. Va.
Two men use a horse drawn plow to dig ditches along the railroad tracks. 12. Pet Goat, Morgantown, W. Va.
Pet Goat, Morgantown, W. Va.